This morning's press release about Amazon adding Bartell Drugs to its Prime Now service reminded of another partnership between the two retailers. In October 2015 Amazon started testing the sale of Kindle ebook gift card in Bartell Drug Stores in the Seattle area. 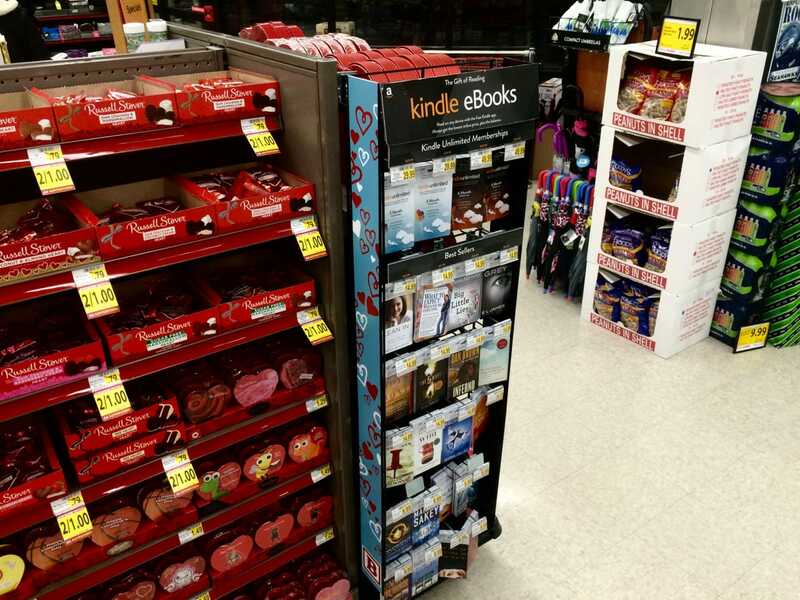 That pilot let consumers walk into a drug store and buy a gift card for a specific Kindle title. The buyer could then log into their Amazon account, type in a code, and add the ebook to their account. That pilot covered 61 Bartell Drug stores which carried a hanging display with cards for 20 Kindle titles and 4 Kindle Unlimited card designs. It was launched so quietly that it took four months before anyone noticed, and now Amazon ended its Kindle gift card pilot program just as quietly as it began. According to my source at Bartell, the pilot ended in June. To the best of my knowledge, the pilot isn't being rerun elsewhere, and since the relevant page on Amazon.com now only mentions KU gift cards this aspect of Amazon's brick-and-mortar retail efforts has either ended or, at best, on hiatus. Given that ebook gift cards have succeeded elsewhere, this is more likely a hiatus than an end. Gift cards have been used to sell digital textbooks, Christian books (Zondervan), and novels (in US Target stores, using card developed by Livrada). Aside from a quietly successful platform in Germany and an ebook gift card startup in Canada, the idea has not had much success. But that Canadian company, Enthrill, has gotten its cards into 3,000 stores in Canada, including Sears, Toys R Us, Safeway, Home Outfitters, Home Hardware, and Longos. Enthrill also supplies the Walmart-brand ebook gift cards in Canada and runs Walmart's ebookstore. That program launched in November 2014. Given Enthrill's success in Canada, there's no obvious reason why ebook gift card can't work in the US market. And yet, in the past year there have been several pilots but no national launch. Livrada had cards in Target stores for a while in 2012 and 2013, but that ended. eBook gift card have their downside; you can buy one on impulse but you can't start reading right away. That would limit the appeal to readers, but this wouldn't have any impact on buying a card as a gift. One would think that drug stores and gift shops like Hallmark stores would want a rack of ebook gift cards. But we still don't have them in the US. How soon do you think that will change?